One of the things I really love about my kids’ current school is the after school drama program. It’s a very low-key program that my kids love, and I see so many benefits! A couple of my kids struggle with speaking loudly, and there is a reason that I have never had a teacher complain about any of my children talking too much in class. Drama is a great space for my kids to practice speaking up, speaking out, and developing self-expression skills that will help them throughout their lives. Drama is all about working together! You can practice, practice, practice, and know all your lines, but it won’t work if the other people on stage with you don’t know what they are supposed to be doing! 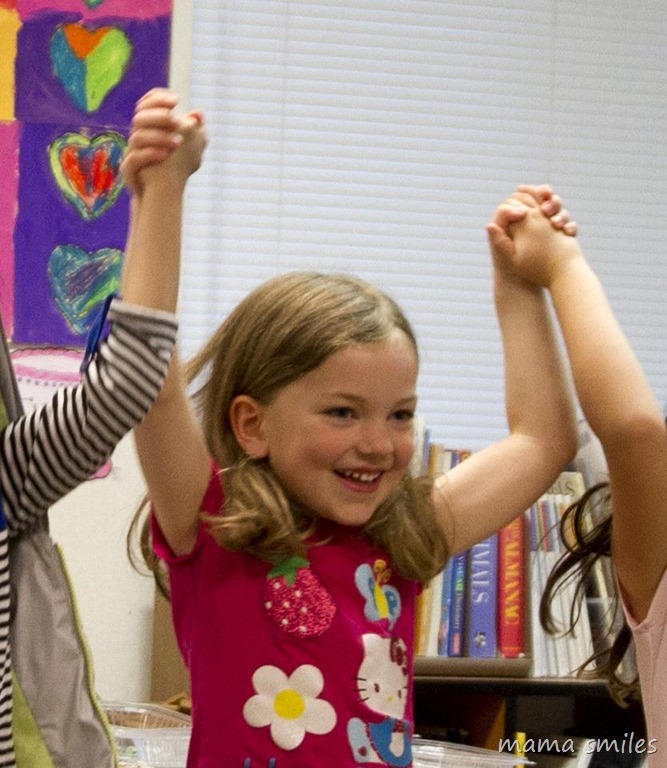 Since you need everyone to do well for the play to work, drama is a wonderful place for kids to learn the benefits of doing what is best for the group. My kids are not naturally risk takers, so they really benefit from drama being a safe space for them to take risk. Kids who love to take risks will also benefit – their parents can rest easy knowing that their kids have a safe place to do this! Sometimes taking risks leads to failure, and drama also helps kids learn to deal with this – missing a line in front of an audience, and not getting the part you wanted when you auditioned. Playing a character is a great way for kids to learn how to take someone else’s perspective – a skill that is key for developing empathy! Plays allow kids to explore a range of different personalities that they might not take the time to learn to understand otherwise. It takes a lot of concentration to stay in character and remember lines in front of an audience under bright lights! Learning how to stay focused on stage can give kids skills that will help them maintain their focus during test-taking, and through job interviews later in life. 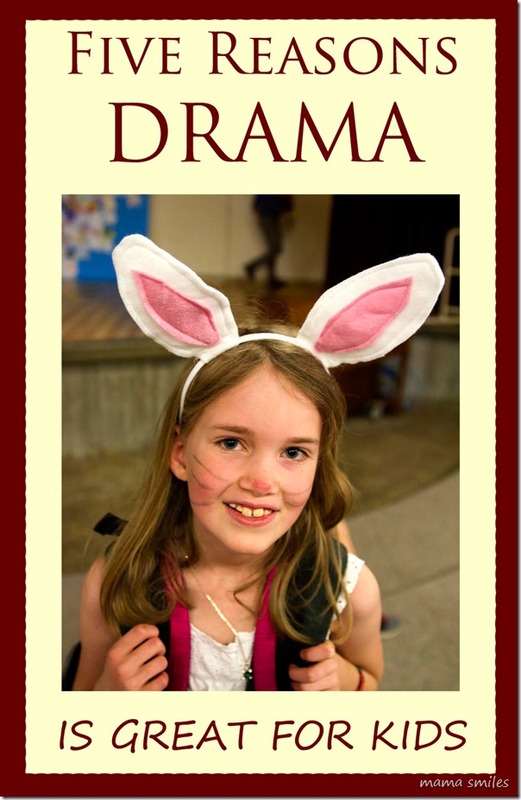 Do your kids enjoy drama? Did you as a kid? I just love this picture of Emma ;) It’s great when schools have drama programs. Our school stages a play in fall-winter, and then has ongoing drama classes once a week in spring term. Your school’s play looked really neat in your post last year! Wow, so pretty! I had drama in high school, and while my teacher sucked, I noticed that I enjoyed it a lot, especially improv. I wish I had gotten into it more. I can imagine it’s great for kids, since they’re so good with make-believe as it is. I love the picture at the top. You can see the pride oozing out of her. 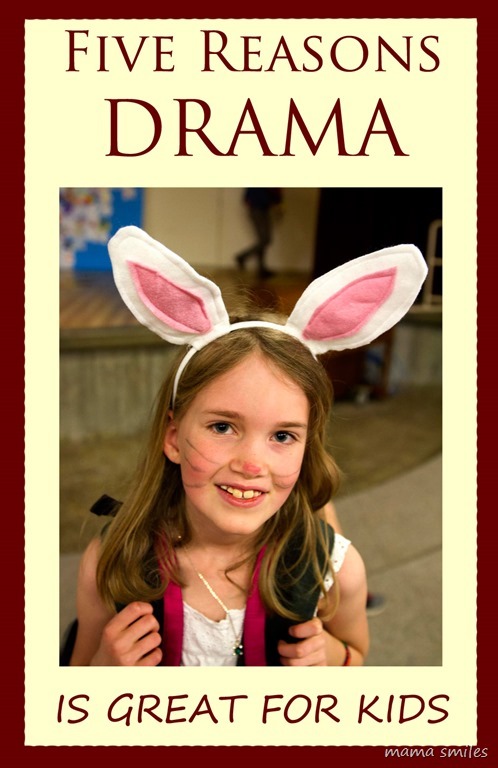 I love drama, and it’s such a great thing for our kids. I tried to get mine to be willing to do something, but they all balked at it when I brought it up. Thanks, Ticia! Johnny balked at first, but he is very interested in a summer camp production of Peter Pan now. Sometimes it’s all about finding the right play! My kids don’t seem to have any inclination for theatre but I love that it’s such a positive experience! I just wish they would give it a try! Love this! Your girls have such beautiful smiles. You really have a knack for boiling down the essence of things, MaryAnne, and I completely agree with your points. Empathy is my favourite, but they are all so important. One of the homeschool graduates in our community is teaching a music theatre class that I have my kids in and they are loving it. We also just yesterday acted out a Little Golden Book at home, which was a blast. I plan to post a video next week. My kids are pretty shy when I comes to drama. Of course, Emma G loves to be dramatic at home, but on stage is another story. They’re both in a drama production coming up at their school. I’m excited to see them on stage!